Canadian businesses with foreign employees that frequently travel in and out of Canada may still be denied entry when returning to Canada. It is important that local companies are aware of this potential problem scenario when deciding to send its foreign employees on foreign business visits. In comparison to Canadian employees that re-enter the country, foreign employees are subject to a number of rules and regulations that most businesses are not even aware of. If for example a foreigner commits a crime outside working hours, the employer may never find out about this. However, if the same employee is send abroad, he or she may then run into problems when trying to enter the country again. It is critical that human resource departments and managers are aware of this additional potential problem when sending its foreign employees abroad on business trips. Where can I find help as a pregnant woman arriving in Ontario? There are many organizations that provide services for pregnant women in communities across Ontario. You can find services and support in newcomer-serving organizations, community-based non-profit organizations, community health services offered by the city or regional government, community centres, and hospitals. Contact the Community Information Centre in your area and ask them about programs and services available for pregnant women. You will be able to find services for before and after your pregnancy (pre and post natal). Public Health Units also offer a program called Healthy Babies, Healthy Children. The Healthy Babies, Healthy Children Program (HBHC) is a prevention and early intervention initiative to provide support and services to families with children from before birth up to six years of age. The Healthy Babies, Healthy Children Program works with hospitals, doctors, public health nurses, home visitors and service agencies in the community. Contact your local Public Health Unit. There are also several programs available for pregnant women that are funded by the Canada Prenatal Nutrition Program (CPNP). The purpose of these groups is to reduce the rate of unhealthy birth weights, improve the health of both baby and mother, and also to encourage breastfeeding. Find a Canada Prenatal Nutrition Program (CPNP) Project in your community. Some Community Health Centres offer pre and post natal services. In some cases, they can provide services to newcomers who have not yet received their OHIP/Health Card. Find a Community Health Centre in your community. You will also want to see a family doctor or a midwife when you think you are pregnant. Family doctors can tell you how to take care of yourself and the baby. They can refer you to an obstetrician. An obstetrician is a doctor who specializes in pregnancy and childbirth. If you do not have a family doctor, we have information about How to Find a Family Doctor you might want to read, in our Health section. Midwife associations have registered health care professionals who provide primary care to low-risk women throughout their pregnancy, labour and birth and provide care to both mother and baby during the first six weeks following the birth. The birth can take place at home or in a hospital as per your choice. If you are afraid of health complications of any kind, you can choose a hospital birth. The services of the midwives in the associations are free to women covered by OHIP. But you will have to pay for laboratory tests as well as hospital room if it is a hospital birth. Click here to use the Association of Ontario Midwives 'Find a Midwife' service to find a midwife in your area. You will need to contact a local midwife to find out what they might charge for services if you are not covered by OHIP yet. OCASI is a registered charity governed by a volunteer board of directors. Its membership is comprised of more than 170 community-based organizations in the province of Ontario. BDCAN.CA - We tried to provide the best and correct source of information that we were looking for when we first moved into Canada or even before moving to Canada. Things like what kind of courses we are able to take even before coming to Canada so that when we are here we would be readu for the job market, where to go for stuffs that we all need. Owning your own home is a key part of the average family's Canadian Dream. Moving In Canada is designed to help people find a job, find a realtor, find a house, plan a move, make the trip, and get settled in. We have lots of great information, and lots of great links to very useful web sites. Whether moving in your community, city, province, we've got COAST-TO-COAST Moving information & tips. We have lots of information about the drive there, usually along the Trans-Canada Highway. Go to a specific PROVINCE or CITY using the options at right. OTTAWA, December 14, 2006 — The Honourable Monte Solberg, Minister of Citizenship and Immigration, today announced that Canada’s New Government will begin discussions with interested provinces and territories to expand the Off-Campus Work Permit program to include private institutions on a pilot basis. As a result of the pilot, foreign students studying at approximately 75 additional institutions could be eligible to apply for off-campus work permits. The program, which allows international students at post-secondary institutions to work off-campus, is currently available only to students at publicly funded universities and colleges. To ensure appropriate controls, the pilot project will apply only to programs and institutions recognized or authorized by the provinces and territories to confer degrees. Provinces and territories interested in participating in the pilot project will need to negotiate memoranda of understanding with the private schools in their jurisdiction and monitor the implementation of the program. After a series of successful provincial pilot projects at public institutions, Minister Solberg launched the Off-Campus Work Permit program nationally on April 27, 2006. Over 8,300 international students have already benefited from the initiative. Prior to the introduction of this program, these students were restricted to holding jobs on the campus of the educational institution at which they were studying. “We want to help more international students get the Canadian work experience they need to adjust to life in Canada, particularly if they wish to stay. These students will be part of a significant labour pool from which regions facing labour shortages could draw. This is a win-win measure – helping students and helping the community,” concluded the Minister. Every visitor, immigrant and refugee must be carefully screened before coming to Canada. This screening is an essential part of the Government of Canada’s commitment to keeping Canada safe and secure. Citizenship and Immigration Canada works closely with the Canada Border Services Agency, the Royal Canadian Mounted Police and the Canadian Security Intelligence Service to carry out the screening process. Canada’s visa officers abroad are our first line of defence. They are specially trained to identify people who could pose a security risk, and they send anyone suspicious for further security checks. Canada also has special officers stationed abroad to help airlines screen people coming to Canada. In the past five years, these officers have caught more than 30,000 people attempting to travel without the proper documents. Since 9/11, Canada has also increased security screening at the border. has not violated the Immigration and Refugee Protection Act. The requirement that certain Canadians born abroad take steps to confirm their Canadian citizenship has existed in some form since Canadian citizenship was first granted in 1947. It is meant to ensure that people who wish to remain citizens retain links to Canada. Since 1977, the law requires that some Canadians born abroad (only those who are part of the second and subsequent generations born outside of Canada) take action prior to their 28th birthday to confirm their Canadian citizenship. If they do not, under section 8 of the Citizenship Act, they automatically cease to be citizens. The first time such persons could lose their citizenship under the Citizenship Act was on February 15, 2005, that is, 28 years after the Act was implemented. Certain Canadian citizens who were born outside Canada on or after February 15, 1977, to a parent who was also born outside Canada to a Canadian parent automatically cease to be citizens on their 28th birthday, unless they take formal steps to retain Canadian citizenship. A somewhat similar but not identical requirement existed between 1947 and 1977. Persons who apply for a citizenship certificate and who are subject to the retention requirement receive a letter advising the holder that steps must be taken before their 28th birthday in order to retain Canadian citizenship. Effective January 1, 2007, as an additional reminder for these citizens to retain their citizenship, and in response to recommendations from the House of Commons Standing Committee on Citizenship and Immigration and stakeholders, certificates for these Canadians now include a date by which they must act to remain Canadians. Citizenship and Immigration Canada is taking steps to remind people of this requirement, and will continue to do so. People who ceased to be Canadian citizens when they were adults can apply to resume Canadian citizenship. For more information about resumption, please see Resumption of Canadian Citizenship. OTTAWA, November 24, 2005 — The Honourable Joe Volpe, Minister of Citizenship and Immigration, today announced the Government of Canada will invest an additional $700 million over five years to make important improvements to the federal immigration system. These improvements include funding to start reducing the current inventory of applications at Citizenship and Immigration Canada, and a new process to allow immigrants with Canadian experience or Canadian education to apply for permanent resident status under the new In-Canada Economic Stream in 2007. The new in-Canada stream is intended for applicants with experience in Canada’s labour market or educational institutions. These immigrants are well positioned to integrate quickly and successfully into Canadian society and the economy, and this new stream will eventually be an important tool in promoting Canada as a destination of choice for immigrants. In ensuring that people with significant labour market or educational experience can make a smooth transition to permanent resident status, we will help build a more responsive and proactive immigration system. The $920 million Canada-Ontario agreement announced earlier this week is funded through the fiscal framework and forms part of the $1.3 billion announced by Minister Goodale. This announcement reflects the key priorities identified by federal, provincial and territorial ministers on November 4, 2005. For further information, visit the CIC Web site at www.cic.gc.ca. Add the spectre of security walls rising along "the world's longest undefended border" to a federal election campaign already being driven by debate about Canada's relations with the United States. The U.S. House of Representatives voted late Thursday to consider erecting "physical barriers" along the American border with Canada, the firmest step yet toward building the kinds of fences now in place on the Mexican frontier to stop the northward flow of illegal aliens and smuggled goods. The directive to the U.S. Department of Homeland Security was passed by a strong majority of the House and contained in an amendment to a controversial immigration bill working its way through Congress. The motion cleared the way for about 1,100 kilometres of new fencing along the U.S.-Mexico border in Texas, New Mexico, Arizona and California, but also urged the agency to "conduct a study on the use of physical barriers along the northern border." Clashes between Prime Minister Paul Martin and U.S. Ambassador David Wilkins over climate change, handguns and softwood lumber -- prompting Martin's stump-speech pledge not to be "dictated to" by the U.S. -- have soured U.S.-Canada relations and prompted opposition claims the Liberals are recklessly provoking conflicts to win votes. On Friday, a spokesperson for Deputy Prime Minister Anne McLellan, who is responsible for handling cross-border security issues in the federal cabinet, said barriers have not been part of Canada's security strategy and have not been raised in bilateral discussions with the U.S.
"Given the size of the border, you're not going to have a wall all along the border," said Alex Swann, noting that "static" defences are widely viewed as less effective than risk-reduction measures such as identity cards. "You never rule out anything in the security game," he added, but "it's not a priority for us." Sponsored by Rep. Duncan Hunter, a California Republican who has long championed fences and walls to halt illegal crossings in the southwestern U.S., the plan to shore up America's borders passed by a vote of 260-159 on Thursday but was strongly denounced by some Democrats as a "Berlin Wall" for North America. "America with walls between Canada and Mexico is not an America that reaches out for people to come here legally," argued Rep. Sam Farr, a California Democrat. Farr's press secretary, Jessica Schafer, told CanWest News Service on Friday the congressman will keep fighting to have the fence provisions stripped from the final legislation. "This would be a massive change in how the borders with Canada and Mexico operate," she said. "Canada is supposed to be our friend. Why in the world would we do this?" Thursday's debate: "Our nation has lost control of its borders, which has resulted in a sharp increase in illegal immigration and has left us vulnerable to infiltration by terrorists and criminals." As Prime Minister Stephen Harper shuffles his cabinet, it has been announced that the Honourable Diane Finley will become the new Minister of Citizenship and Immigration. The Honourable Monte Solberg will be moving on to become Minister of Human Resources and Social Development. Ms. Finley was first elected to parliament in 2004, representing the rural Ontario riding of Haldimand-Norfolk. Since February 2006 she had been serving as Minister of Human Resources and Social Development (HRSDC). 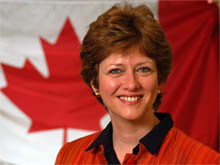 Prior to her Conservative Party of Canada forming the government in early 2006, Ms. Finley acted as the Official Opposition Critic for Agriculture and Agri-Food. Mr. Solberg leaves the Ministry of Citizenship and Immigration after 10 months on the job. In his new position at HRSDC, he will be working closely with Ms. Finley in co-ordination of policy and programs. The prior experience earned by Ms. Finley at HRSDC should serve her well in her new post. The knowledge of human resource needs in the Canadian economy should assist her in ensuring that immigrants to Canada are met with jobs and training. The experience will also prove useful in working with other government departments to provide services for immigrants. Ms. Finley holds an MBA from the University of Western Ontario, working in both the public and private sectors before entering politics. Several Canadian Members of Parliament (MP) have spoken up recently in defence of dual citizenship. Their comments came in response to recent calls for the newly elected leader of the Liberal Party of Canada Stephane Dion. Dion was born in Canada but retains dual Canadian and French citizenship, the latter obtained at birth through his mother. Since taking the helm of his party, some parliamentarians from opposing parties have suggested that holding dual citizenship implies divided loyalties inappropriate in his position. It also takes place as Citizenship and Immigration Canada undertakes a review of Canada's practices of recognition of dual citizenship. Several of Mr. Dion's colleagues in Ottawa hold dual citizenships, particularly amongst the 41 MPs born outside of Canada. Toronto MP Jim Karygiannis, who also holds Greek citizenship, said he is not planning to give up his Greek passport, saying "my constituents don't want me to do that. I'm very proud of my roots." Likewise, Vancouver MP Ujal Dosanjh, who immigrated to Canada from India but does not hold Indian citizenship, defended dual citizenships as an asset for Canadians do embrace global opportunities. "We have an increasingly mobile world, and you can't contend with these new realities by building walls," said Dosanjh. Since 1977, when the last restrictions were removed, acquiring Canadian citizenship has not required an individual to cut ties with their country of origin; nor has taking on the passport of another nation required an existing Canadian citizen to relinquish their Canadian passport. Over 500,000 Canadians living in Canada currently hold more than one passport, along with many Canadians living overseas. Ontario MP Wajid Khan is leaving the Liberals to join the Tories, Prime Minister Stephen Harper announced on Friday. "I am proud to announce today that Wajid Khan, the member of Parliament for Mississauga-Streetsville, is joining our Conservative caucus," Harper told a news conference on Friday, with Khan at his side. "I believe that this gesture made by Mr. Khan is a positive message for all Canadians — new Canadians as well as Canadians who have been here for a long time: In our party, there is room for all Canadians," he said. Khan, formerly a pilot in the Pakistani military, told reporters that while "politics makes strange bedfellows … nothing about my decision to join the Conservative caucus feels strange to me. "The best leader for Canada is the man who now has the job, Mr. Harper," he said. As a Liberal MP, Khan has served Harper since August as a consultant on the Middle East and Afghanistan. Liberal Leader Stéphane Dion had reportedly told Khan to choose his political loyalties, saying it was "bizarre" that a Liberal MP could serve as a consultant to the Conservative prime minister. Dion posted a statement on the Liberal party website after the defection that expressed "regret" at receiving word of Khan's decision. "I was never comfortable with Mr. Khan serving as an advisor to a Conservative Prime Minister, as Mr. Khan has done since August of last year," Dion's statement said. Khan's move across the floor gives the Tories 125 seats, leaving the Liberals with 101. The minority government will now need the support of 29 opposition MPs — the same number the NDP has — to pass legislation in the 308-seat Parliament. Khan said he had called Dion to inform him of the decision and said he has received support for his decision from the president and members of his riding association. In an interview with the CBC following the defection, riding association president Khalid Sagheer said Khan "is my friend, I support him and I will continue to support him." Asked whether backing Khan would mean switching party memberships himself, Sagheer said "that decision will come in due course." "I agree with him and my own personal opinion is that the Liberal party has been taking us for granted — immigrants that have worked and supported the party so much, it's been so far only a one-way street," Sagheer said. Harper said Dion had pushed Khan to make the decision. Khan "wasn't asking the Conservative Party [to join], but in the end the choice was made by Mr. Dion," Harper said. "Mr. Dion said Mr. Khan … couldn't be a true Liberal and participate positively in the government of Canada." "When I'm given a choice … between a political party and my country, I will always choose Canada and that's why I chose the Conservative government," said Khan. Earlier on Friday, Dion told CBC News that he was confident Khan was a loyal Liberal and that there was "no indication" a defection was coming. Harper said "the first phase" occurred when Khan first approached him in August to collaborate with the government on Mideast issues, after police foiled an alleged Toronto bomb plot and arrested 17 Muslim suspects. "He contacted me directly and offered to help in any way he could," Harper said. "The more we worked together, the more both of us began to realize that politically, we have an awful lot in common." 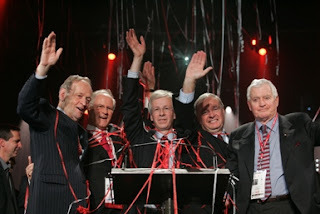 Fellow Liberal MPs at the time questioned how Khan would balance his allegiance to the party with his new role as an adviser to the prime minister, but Khan noted that he had sought approval from then Liberal leader Bill Graham to take on the job. 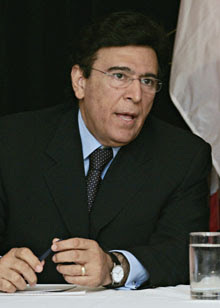 During his time as an adviser to the government, Khan said he felt the Liberal party seemed to be out of step with his ideas for foreign policy and family values. Khan, 60, immigrated to Canada in 1974, emerging in Toronto as a successful businessman and a prominent voice for the Pakistani and Muslim communities. He left the Liberal caucus on Aug. 11, though he continued to sit as a Liberal. Harper shuffled his cabinet on Thursday, moving several key ministers into new roles, and expanding the number of MPs in cabinet. 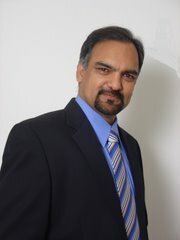 In the 2006 federal election, Khan defeated Conservative candidate Raminder Gill by 5,792 votes, taking 46 per cent of the vote.